The Hamptons have long been known as a summer getaway spot for New York's elite. I predict they will soon be famous for being the home of the best gluten-free chocolate chip cookies around. Based in Southampton - on New York's Long Island - Tate's Bake Shop is the vision of Kathleen King, who began baking cookies at age 11. Consumer Reports just rated Tate's chocolate chip cookies the best in a recent taste testing, noting the "big butter and chocolate flavors and smooth chocolate chips. . . . like a really good homemade cookie." After being beseeched with customer requests, Tate's introduced gluten-free chocolate chip cookies and brownies earlier this year. The gluten eaters in our house conducted a "Pepsi Challenge" of sorts (for those of you old enough to remember that ad campaign), and actually preferred Tate's gluten-free cookies to the bakery's conventional ones. The ingredient profiles are practically identical, with semi-sweet chocolate chips leading the way in the thin, snappy cookies. (The gluten-free version contains rice flour.) The gluten-free sweets are made in a facility that processes gluten-containing foods, but are made separately from the bakery's other products. In Philadelphia, Tate's gluten-free chocolate chip cookies are sold at Klein's Supermarket (2401 Pennsylvania Ave., 215-232-1120) and at Di Bruno Bros. (1730 Chestnut St., 215-665-9220). Young's Produce in Havertown (170 W. Eagle Rd., 610-449-2122) also carries the cookies. Both the cookies and brownies are available for online ordering directly from Tate's. Readers can save 15% on online orders through December 15 (at midnight Eastern) with discount code BLOGGER. 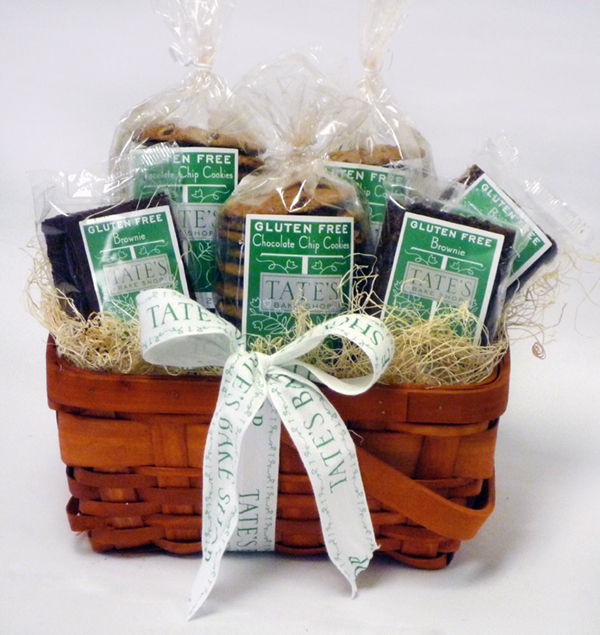 Tate's has offered one lucky Gluten Free Philly reader a prize pack consisting of three packages of gluten-free cookies and three gluten-free brownies. To enter, leave a comment to this post or on the Gluten Free Philly Facebook page about what other kind of gluten-free cookie you'd like to see from Tate's. Follow Tate's Bake Shop on Twitter or like the bakery's Facebook page (and mention that you've done so in your comment) and you'll get an extra entry. The giveaway runs now through Sunday, December 4 at 11:59 p.m. Eastern Time. I’ll select one winner the next day via random.org and will contact him or her by email or through Facebook, depending on method of entry. If I don’t hear back from the person with his or her mailing address by the following Tuesday at 8 p.m. Eastern, I’ll select another name. DISCLOSURE: Tate's Bake Shop is offering the prize pack. Neither I am nor any immediate family member is an employee, officer, director or agent of Tate's Bake Shop or its respective parent, subsidiary and affiliated entities, advertising and promotional agencies. My full Disclosure Policy can be found at the blog's Disclosure page. If you're not making your own gluten-free desserts for Thanksgiving, be sure to get out this weekend and grab your favorites before the stores sell out. Local Whole Foods Markets have a variety of pies, stuffing cubes and cornbread along with delicious pumpkin cheesecakes from Moondance Heavenly Desserts. Staying with the turkey theme (work with me here), the new Bobby's Burger Palace in Cherry Hill, which I reviewed this week, serves up gluten-free turkey, chicken and beef burgers. We brought our own gluten-free bun to sandwich the patty, but hopefully the chain will consider having them on hand in the future. Square 1682, the New American eatery at the Hotel Palomar in Center City Philadelphia (121 S. 17th St., 215-563-5008), has a gluten-free dinner menu. The area's only Roly Poly, in Mount Laurel (4070 Dearborn Circle, 856-231-0615), offers sandwiches made with La Tortilla Factory's gluten-free wraps. Gluten-free items are noted on the menus at Doylestown's Knight House (96 W. State St., 215-489-9900). Thanks to reader Richard S. for the heads-up. Levittown residents, Fiore's Paesano's Pizzeria (1253 Woodbourne Rd., 215-547-5353) has brought gluten-free pizza to your nabe. Cheese ravioli and other gluten-free options are available at Romanelli's Garden Cafe in Galloway (279 S. New York Rd., 609-652-0179). Marc Vetri's Amis trattoria in Philly's WashWest section (412 S. 13th St., 215-732-2647) now has a gluten-free menu. In addition to pizza, the Seasons Pizza location on Route 202 in Wilmington (3901 Concord Pike, 302-478-2009) has expanded its gluten-free menu to include chicken and eggplant parmigiana, lasagna, baked ziti and cheese calzones. Reader Dan let me know that the J.B. Dawson's location in Drexel Hill has closed. 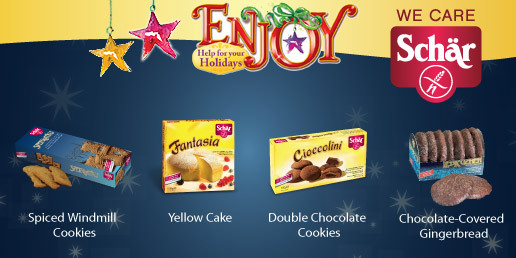 Through the end of 2011, Sweet Christine's Gluten-Free Bakery in Kennett Square is offering free shipping on online orders of $25 or more. Wegmans will be giving the Whole Foods in North Wales some competition for the gluten-free dollar, although it may not be until 2013. The family-owned supermarket chain plans to open at the Montgomery Mall at the site of the former Boscov's department store. Amy's Kitchen has several new gluten-free products hitting stores next month: three vegan wraps made with rice flour and a broccoli & cheddar bake bowl. The Philadelphia Gluten Free Pasta Ravioli Company will debut its new gnocchi mixes at Di Bruno's (1730 Chestnut St., 215-665-9220) with a sampling this Saturday, November 19, from 11 a.m. to 1 p.m. A gnocchi shaping tool is free with purchase. After you've finished all of the Thanksgiving dinner leftovers, head to The Bards Irish Pub on Rittenhouse Square (2013 Walnut St., 215-569-9585) on Sunday, November 27 for a gluten-free dinner event beginning at 3 p.m. Brian Kovalchuk, the president and CEO of Bard's Beer, will be on hand for a meet-and-greet. The Philadelphia Gluten-Free Supper Club will reconvene for dinner and a holiday cookie exchange at The Silverspoon in Wayne on Thursday, December 8. For more information, email reader Daria D.
Have a great weekend and a safe and happy Thanksgiving! To market, to market to buy a . . . gluten-free bread? The target date is December 1 for the opening of the region's newest gluten-free bakery, located at Philadelphia's venerable Italian Market. Toté (1024 S. 9th St., 215-551-5511), taking over the spot formerly occupied by Mexican luncheonette Loncheria Lupita, will focus at the outset on items like fresh breads, rolls and pizza pies. The owners also plan to offer hard-to-find packaged gluten-free products. To boot, it's a few doors down from Paesano's Philly Style, where you can grab a gluten-free sandwich. 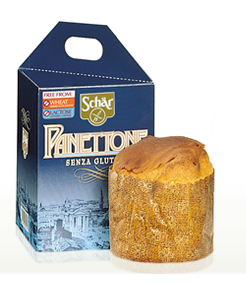 Earlier this week, I shared the news that Wegmans markets will carry gluten-free Christmas sweets from Schar, including panettone. Several readers set me straight that spekulatius - the spiced windmill cookies also being offered by Wegmans - are Dutch, not German. The windmill part should have clued me in, but in my defense Wikipedia distinguishes between German Spekulatius and Dutch Speculaas. The German variety is made with baker's ammonia, which is used in the Schar product. Redstone American Grill in Marlton (500 Route 73 S., 856-396-0332) and Plymouth Meeting (512 W. Germantown Pike, 610-941-4400) now has a gluten-free menu. My wife and kids ate at the Marlton spot yesterday and had a great meal there. In West Chester, i-Pasta (134 E. Gay St., 484-887-0760) has gluten-free pasta. Mama Palma's is the latest restaurant to bring gluten-free pizza to Center City Philadelphia (2229 Spruce St., 215-735-7357). Hat tip to reader Kathryn M. for posting the news on Facebook. Jules Thin Crust, which makes a phenomenal gluten-free pizza in Jenkintown, Newtown and Doylestown, announced that a new location will open on the Main Line in Wayne next Spring. Gluten-free cookies and cupcakes from allergen-friendly bakery Sweetness are now available at Christopher's in Wayne (108 N. Wayne Ave., 610-687-6558). Princeton Soup & Sandwich Company (30 Palmer Square E., 609-497-0008) has picked up The Grain Exchange's gluten-free desserts. InFusion Coffee & Tea in Mt. Airy (7133 Germantown Ave., 215-248-1718) has gluten-free baked goods from Main Line Baking Company and The Little Bakery. Thanks to reader Annsley K. for the tip. Reader Shari S. let me know that gluten-free sugar cones are now at Benjamin's Best in Old City (401 Chestnut St., 215-829-9510). Philly's own Monica Glass, the pastry chef at Center City bistro 10 Arts, is leading a gluten-free holiday cooking class at Sur La Table in King of Prussia on Monday December 5. The menu includes brown butter bourbon biscotti, chocolate crinkle cookies, shortbread thumbprints and gingersnaps. Registration is available on the store's event page. Now that the monthly calendar is turned to November, neighborhood jack-o'-lanterns have been replaced with signs commemorating the next major holiday . . . Election Day. I kid, I kid. (Do go vote today, though.) Soon enough, many of us will be decking the halls with boughs of holly and shopping for the perfect Christmas tree. Customers can find them in the Nature's Marketplace section of the store while supplies last. Most people don't need much more of an incentive to dig into a slice of piping hot pizza than the aroma of tomato sauce, melted cheese and spices, or maybe some green peppers or sausage to boot. For those that do, though, there's something unique to put on your pie. Featured in Food Network magazine, gluten-free Pizza Prints are edible designs that are applied to baked and sliced pizzas. The prints come in lots of different images, from pro basketball and college teams to Nickelodeon characters. 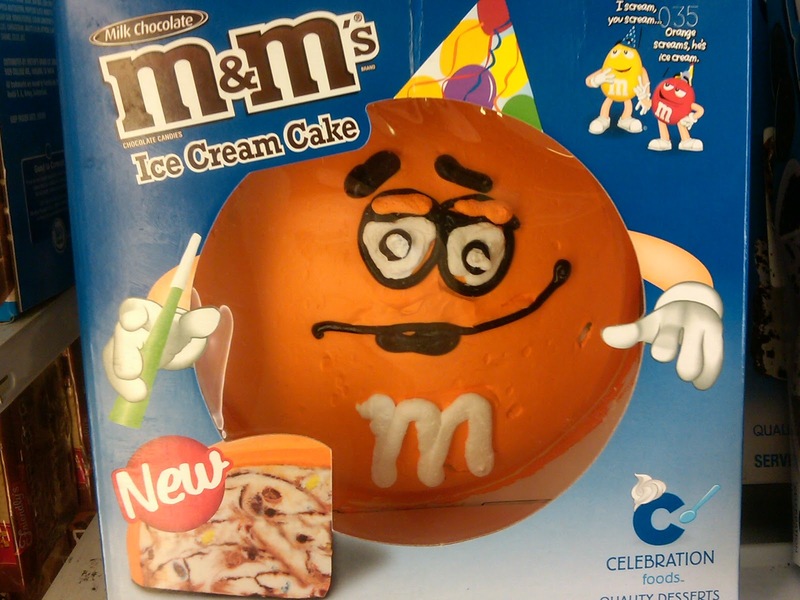 There are also more generic designs to celebrate birthdays, holidays and other occasions. 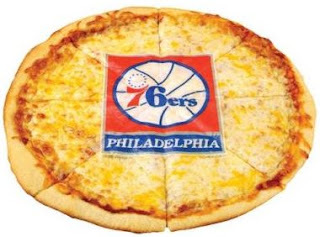 A number of local eateries that offer gluten-free pizza carry Pizza Prints, including Mannino's in Morrisville, Kembleville's Village Pizza & Subs, Giuseppe's in New Hope, Tony's Pizza in Haddonfield and Pietro's Pizza in Manahawkin. Various prints can be ordered directly from the company by calling 1-800-806-2595.